Like Ursula said, “Life’s full of tough choices, innit?” Choosing a Walt Disney World Resort is definitely one of those tough choices. Your budget may be steering you toward a value resort, but your desire for more floor space, bigger beds or a castle view may be whispering “Choose a deluxe!” Of course, you could compromise, and select one of the beautiful moderate resorts. But did you know you can also choose to have a “split stay” and book two different resorts for your vacation? Stormalong Bay’s leisure pool – The sand bottom is perfect for kids! 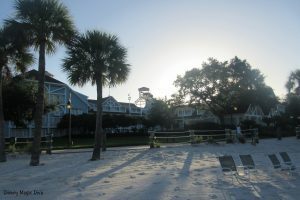 We recently decided to cross an item off our Disney Bucket List, and stay at either Disney’s Beach Club Resort or Disney’s Yacht Club Resort. I’ve long admired Stormalong Bay, and on this particular trip we were bringing our grandkids. 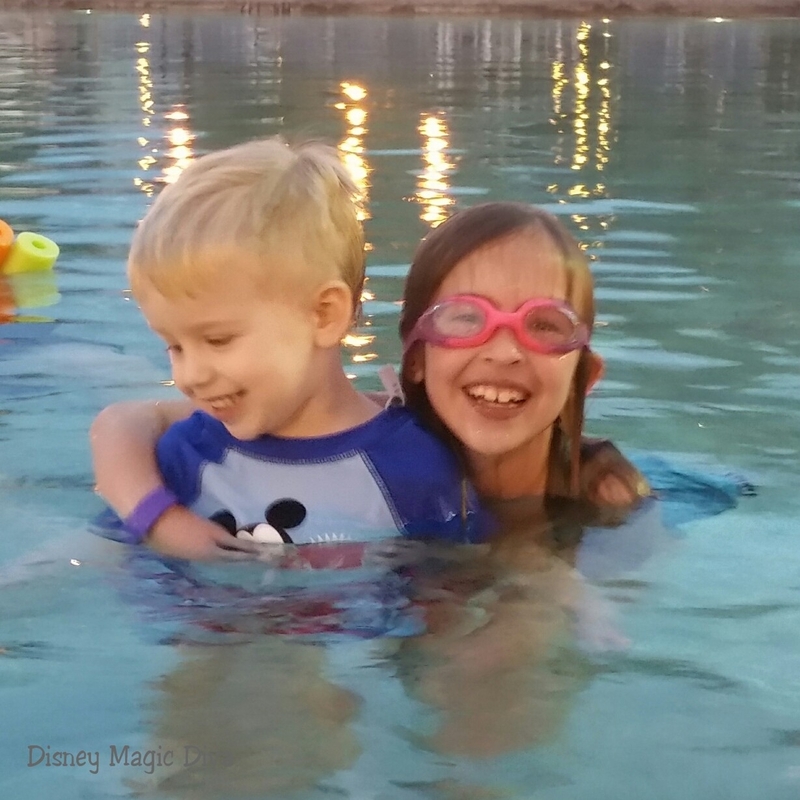 We knew an afternoon nap was going to be a necessity for our 3-year-old grandson, so we decided to make the most of a mid-day break from the magic of the parks by combining nap time with some awesome pool time. I went online and began pricing out our vacation at either Yacht Club or Beach Club. I noticed that there was quite a price difference between the two! 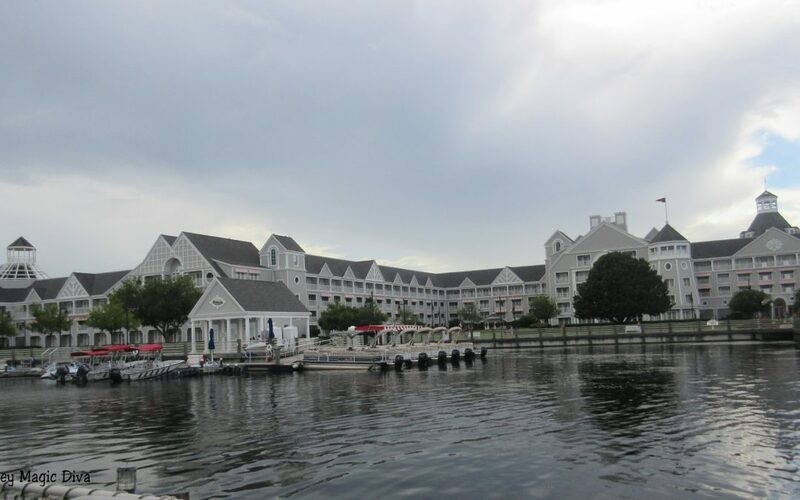 Since they are really sister resorts, and both share Stormalong Bay, it didn’t really matter to me which resort we booked. For the first few days of our trip, Beach Club was less expensive. 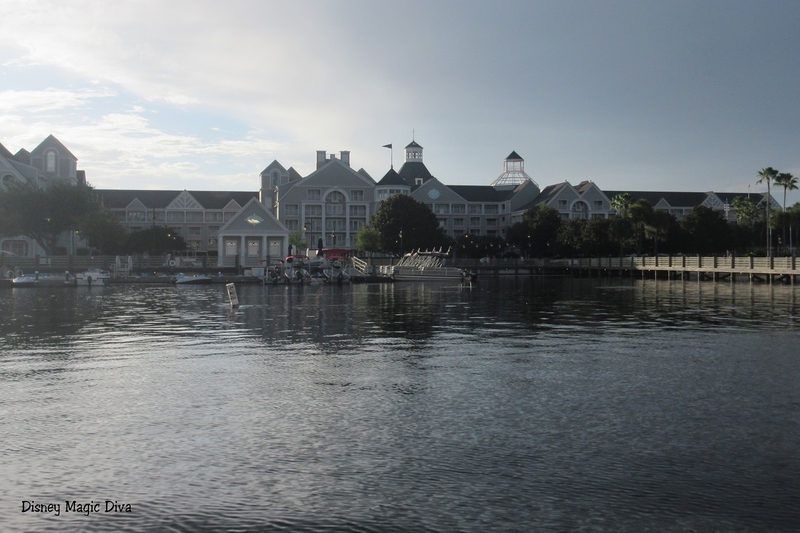 For the latter part of the trip, Yacht Club was less expensive. So what’s a Diva to do? Book a split stay! Magical Express: Since I had 2 reservation numbers for this trip, I didn’t want the Magical Express to be linked to just one of the reservations. So to set my mind at ease, I left the Magical Express information blank, then called later to add it. Because we were going to be dropped off at one resort, and picked up to return to the airport at a different resort (with a different reservation number), I wanted to call and make sure that information was clear. If you use a travel agent, (like Patricia with All for Dreams Travel) your agent could handle all this for you! Magic Bands: Two reservations meant two magic bands. We were excited about this prospect, because we love collecting Magic Bands. Gotta get all the colors, you know! But if you don’t want to be bothered with multiple Magic Bands, it’s not a problem. You can just use one band, and everything linked to your My Disney Experience account will still be available to you. Park Tickets: My husband, granddaughter and I all have annual passes, but we had to purchase a park ticket for my grandson this time, since he recently turned 3. We were able to link the ticket to his My Disney Experience account, and had no problems then using it for the entire length of our stay. TIP: If you want to purchase a room/ticket package, buy park tickets for the entire length of your vacation with your first stay. Then for the second part of your stay, book a room only. This way you can take advantage of the lower per-day price of park tickets. One 7-day park ticket is less expensive, say, than a 3-day ticket plus a 4-day ticket. Just be sure to use all the days of your park ticket within 14 days of its first day of use. FastPass+: Since your park ticket is associated with your first stay, you can book FastPass+ experiences for your entire vacation at 60 days before check-in! So well before 60 days prior to your second stay, you’ll be booking FastPass+ for the last part of your trip. That’s magical! Luggage: I despise dealing with luggage. One of the reasons I love staying at a Walt Disney World Resort is that I can use the Magical Express, and never have to handle my luggage after I check it at my departure airport. (Read my article here for other advantages of staying on property.) So the thought of packing and moving to a different resort midway during my vacation wasn’t too appealing to me. To help ease the burden, we kept unpacking to a minimum. Typically, we will unpack clothes and either hang them or place them in the dresser drawers. We skipped that this time. We used Fancy Free Diva’s tip of packing the kids’ clothes in Ziploc bags – one complete outfit in a bag. While moving was a minor hassle, it wasn’t as bad as I feared. During naptime on the day before we moved, we did the bulk of our packing. We set out our clothes and toiletries for the next day, and packed everything else we possibly could. We had groceries delivered for this vacation from Garden Grocer, (which I highly recommend – so easy and convenient!) so I was a little concerned about having all of that moved to our new resort too. But really it was pretty painless. 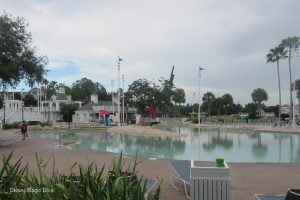 Both Yacht and Beach Club share Stormalong Bay – our favorite Disney pool! On moving day, when we were ready to leave, we called Bell Services. They were at our room in about 5 minutes and took care of everything! They moved our luggage and stored our groceries – perishables and all. Then we took off for the parks. While at the park, we got a text that there was an issue with our room, and we needed to stop at the front desk when we were ready to check in. For some reason Beach Club didn’t want to release our reservation, so they had to manually link each of our Magic Bands to our Yacht Club room. It wasn’t quite as magical as it should have been, but really a minor inconvenience. Once our Magic Band situation was straightened out, we stopped by Bell Services and asked them to deliver our luggage and groceries to the new room. They practically beat us there. TIP: While our split stay involved sister resorts, that certainly isn’t required. You could choose to stay at a value resort, then splurge and move up to a deluxe! This is a great option if you really want to stay on the monorail loop, for instance, but your budget just won’t allow it for your entire vacation. So would we do it again? Absolutely! I’m not sure I’d want to move and change resorts every night, but if you have a vacation for at least 6-7 nights and want to try a couple of different resorts, it’s a great option. Do you have a few resorts you’ve been waiting to explore? Get in touch with Patricia at All for Dreams Travel and have her help you book a split stay! All for Dreams Travel is an Independent Agency with Gateway to Magic Travel, an Authorized Disney Vacation Planner. 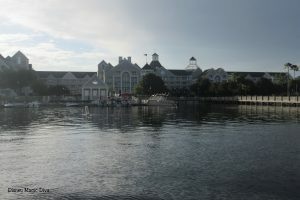 Why Should I Stay at a Walt Disney World Resort?